Here’a nice recipe that appeared recently in the New York Times. You can cook the lentils up to four days ahead and store them in the fridge. Bring the lentils back to a simmer before proceeding with the recipe. You can serve it as a main dish for a light meal.This recipe makes quite a lot. We halved it for the two of us and still had some leftover. If you can’t spot the chives and/or parsley in the photo, that’s because I forgot to add them at the end. The dish would probably have been even tastier if I hadn’t left them out! In a medium pot, combine the lentils, onion, two of the garlic cloves and the bay leaf with 6 cups of water. Bring to a gentle boil over medium-high heat. Add salt to taste, cover, reduce heat to low and simmer 25 to 30 minutes, until lentils are cooked through but still have some texture (they should not be mushy). Taste and adjust the salt. In a small bowl mix together the vinegar, remaining garlic, salt to taste and olive oil. Set aside. Place a strainer over a large bowl and drain the lentils. Reserve ¼ cup of the broth. Return the lentils to the pot. Whisk the reserved broth into the dressing. Stir the dressing into the lentils. Add the goat cheese and stir until it melts into the lentils. Season to taste with pepper and stir in the herbs. 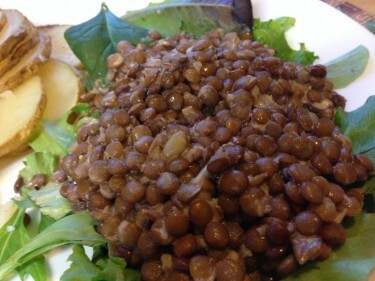 Line a platter, salad plates or wide bowls with the arugula or greens and top with the lentils. Serve warm. If you’re of a certain age, you probably have a yellowing copy of Anna Thomas’s book The Vegetarian Epicure on your shelf. We bought this book, published in 1972, soon after we were married when we were getting away from the old meat-and-potatoes meals and discovering fresh vegetables and all these years later we still enjoy some of the recipes. This recipe makes a very tasty sauce. It’s easy and it makes a huge amount. You can freeze half of it unless you’re serving a large number of people. It will also keep nicely in the fridge for a couple of weeks. I’ve altered the recipe a bit, mostly by cutting the original amount of oil and tomato paste by half. I like to serve it with grated Parmesan cheese, but it’s good without cheese as well. Heat the olive oil in a large saucepan or Dutch oven. Add the garlic and heat gently. 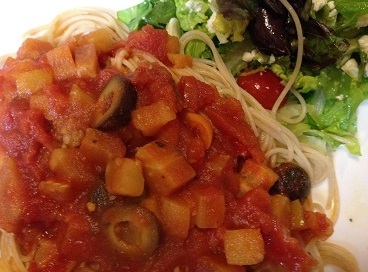 Add the peppers, eggplant, tomatoes, olives and capers, and stir well to coat the vegetables with oil. Add the remaining ingredients, stir again and cover the pot. Lower the heat to a very small flame and allow the sauce to simmer gently for about 1 hour. Stir occasionally to keep it from sticking, and add more wine or water if it gets too thick. Serve on your choice of hot pasta, topped with shredded Parmesan if you like. I clipped this recipe from the New York Times about a month ago and made it for one of the recent holiday dinners. New York Times recipes are never what you’d call easy, but this one is complicated only because you need to measure out a lot of ingredients. Simplify your life by getting all the ingredients ready the day before you want to serve the dish, and marinate the chicken overnight. The actual cooking is very easy. I used a little less salt than the recipe calls for since I use kosher chicken, which retains some residual salt from the kashering process. I’m not sure if you really have to go to the trouble of blanching the lemon slices; seems to me you could just throw them in with the marinade, especially if you’re letting the dish sit overnight. This is what I will probably do next time I make it, but his time I followed the directions. I doubled the recipe — didn’t seem worth the effort to make the dish for just the two of us, and we were having company for the holiday. I had to use two gallon-size Ziploc bags to marinate everything, but it was easy enough to put one chicken in each bag with half the marinade and half the carrots. The next morning, turn the chicken over in the bowl, or give the Ziploc bag a little squeeze and turn it upside down a few times to make sure everything is getting marinated evenly. The original recipe said the chicken would take 20 to 30 minutes for the breasts to brown and 30 to 40 minutes for the legs and wings, and suggested removing the pieces as they got done. I found the roasting took a little longer — and I know from experience that chicken will brown much more nicely if you baste it a few times while it’s roasting. Instead of spooning the carrots over the chicken, I decided to serve them separately — mainly because I didn’t have a large enough serving plate! The carrots worked well as a side dish. Put a small pot of water on the stove to boil. Quarter the lemon lengthwise and remove any seeds. Thinkly slice crosswise into small wedges and add the lemon to the boiling water. Blanch for two minutes, then drain and cool. In a saucepan, whisk together the lemon juice, orange juice, oil, mustard, honey, salt, bay leaf, red pepper flakes and black pepper. Bring to a boil and simmer for about 5 minutes. Cool. Put the chicken into a large bowl or gallon-size Ziploc bag and add the cooled honey mixture. Add the carrots, onion, dates, thyme and lemon slices. Turn the mixture several times to coat every piece of chicken. Marinate for at least 30 minutes at room temperature, but preferably overnight in the refrigerator. Heat oven to 425 degrees (or 400 for convection). Transfer all ingredients, including marinade, to a large pan with a rim. The chicken should be skin-side-up in a single layer. Roast, basting a few times, until the chicken is browned and cooked through, about 45 minutes. Remove the chicken and keep warm. Stir the carrots and continue roasting another 10 to 12 minutes. 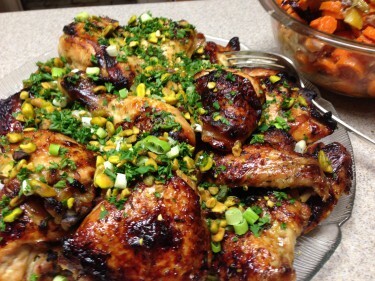 Spoon the carrots over the chicken and top with the cilantro or parsley, sliced scallions and pistachios. This is a good recipe for a holiday meal — or anytime! We went to Detroit’s Eastern Market on a recent Tuesday and got some beautiful leeks! If you’re not used to cooking with leeks, give them a try. They look like giant scallions and have a similar flavor, but milder. Lop off the dark green tops, then slice each leek in half lengthwise so you can clean them easily. Run the pieces under running water while you carefully fan out the layers to rinse out any dirt and grit. Dry with a paper towel and lay each half flat to slice. I wanted to double the recipe for a company meal and discovered I had only one cup of bulgur in my cupboard — and no time to shop. I had a package of “freekah,” another Middle Eastern cracked wheat product, so I used a cup of each. The freekah was delicious, but it imparted a slightly smoky flavor; using bulgur alone would make it a little more bland. I didn’t have any currants so I used raisins. This recipe was adapted from one that appeared in the Detroit Free Press, and which originally came from the American Medical Association Family Cookbook by Melanie Barnard and Brooke Dojny. In a medium saucepan, heat the oil. Add the leeks and 2 Tbs. of the broth and stir to combine. Cover and cook over low heat, stirring frequently, until the leeks soften and start to brown, about 8 minutes. 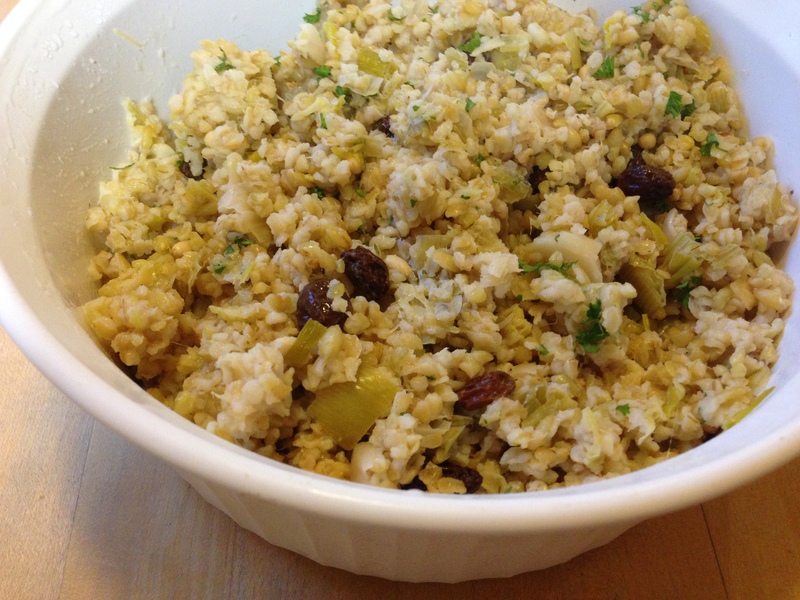 Stir the toasted pine nuts and lemon juice into the bulgur with a fork. Season to taste with salt and black pepper.